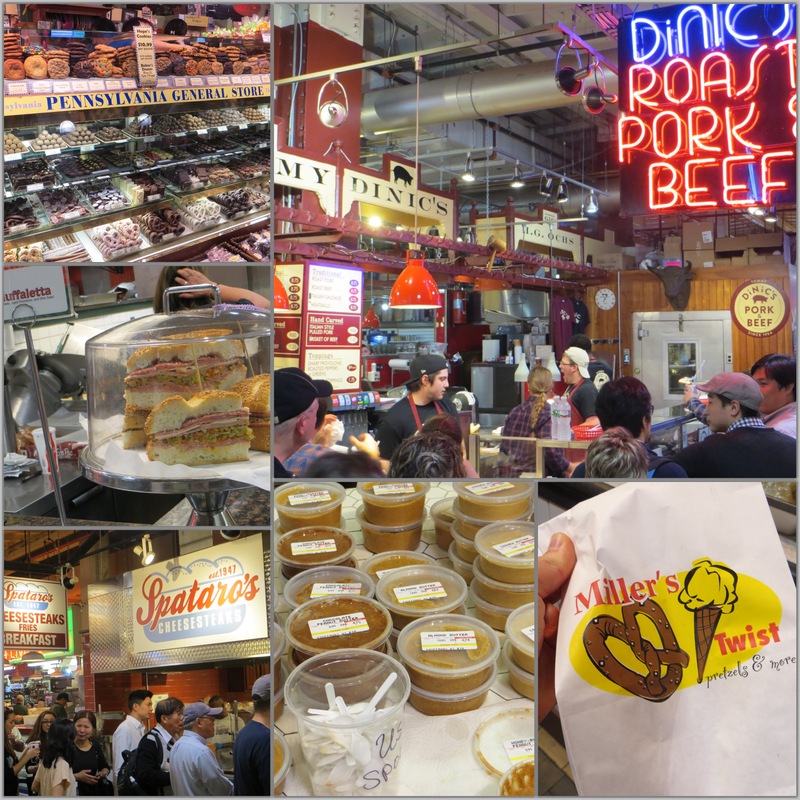 So I promised a recap from last last week’s Philly Broad Street and day two. If you missed out on part one and don’t want to scroll down (no judgement), here it is. The main reason I traveled to Philly was for the Sunday Broad Street 10-miler. 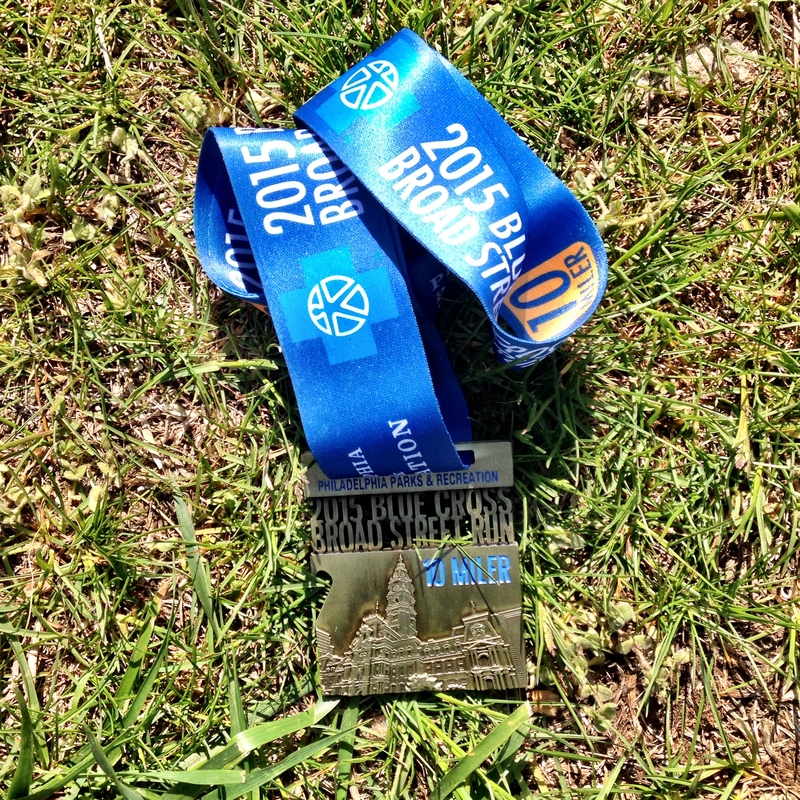 I had signed up for the lottery on a whim and it worked out that my half-marathon training plan called for 10-11 miles that particular weekend. Funny enough, I have actually spent the last 3 of the 4 years racing on my birthday or birthday weekend. While in college, I raced in the popular Wildflower Triathlon in central California. I even spent my 21st birthday swimming, biking, and running, making for a perfect day in my mind. No 12:01 rager. Instead I was in my tent and somewhat asleep by 8pm. Anyways, Broad Street. This is a mega-popular race that requires entry through a lottery system. When my friend Alex brought it up a few months back to us NP_NYC folks, I thought it sounded like a good idea. We then realized that it was the same weekend as the North Face Endurance Challenge in New York, so there was some FOMO going around. The ever so necessary pre-race photo with the gear and gu properly laid out. 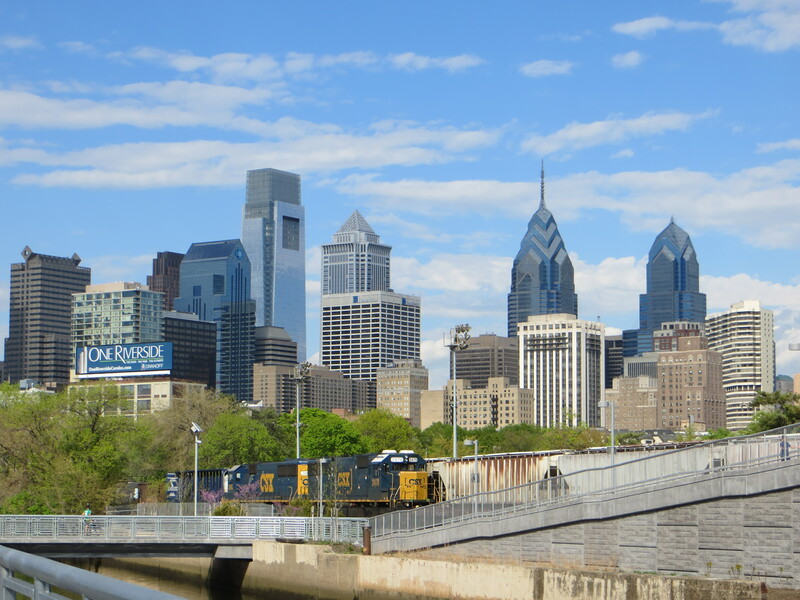 Lucky for me, we had been staying with a family friend in her apartment at UPenn and super close to a SEPTA station. Once my alarm went off at 5:30, is was time to change, eat 1/2 a banana and 1/2 of a Honey Stinger Waffle, chased by some cold brew and almond milk, and then out the door. Funny thing about the SEPTA is that they require cash only and exact cash at that. In typical Kaitlin fashion, I heard my friend Mia tell me this but didn’t truly listen. When I arrived, I had a $5, $20, and $1.25. I needed $2.25. I was ready to just hand over the $5 but the lady at the booth was nice and let me in for $1.25. To get a better understanding of where we ran, this is the Broad Street line. We ran the very top all the way to the bottom and beyond to the Navy Yards. Now, there were a few different thoughts going through my mind before the starting gun went off on Sunday. Honestly, some of them were curse words, wondering what I had gotten myself into. I’ll attribute those to the nerves because even though I have been “racing” for the last few months, every big race event has a different vibe and of course pressure to do well not tank. What was really nice about this race was that each different corral had its own starting gun. This helped to even out some of the runners on the course and gave everyone some breathing room. I decided to run sans headphones purely in preparation for my next race with my sister and because I didn’t want to miss the vibe of the city. We ran through all different parts of Philly – saw thousands of people cheering, listened to the Temple band (the drums always being my favorite part), and a few other musical acts. My friend had told me that the race was a pretty straight shot and that you would see the entire course in front of you. Hmmmm, that’s not usually good for me. Example 1, when we had to run fartleks for high school cross country on a flat straight road in Mammoth. Then example 2 in last year’s Brooklyn Half where miles 10-13 pretty much drag on foreeeever. Yes, that is where I tanked. Alas, the course wasn’t as bad as I had predicted and even though I did struggle through the last couple miles, taking baby sips at 4 aid stations (2x gatorde and 2x water) + a Honey Stinger Gel, I pushed through and was proud of the race. 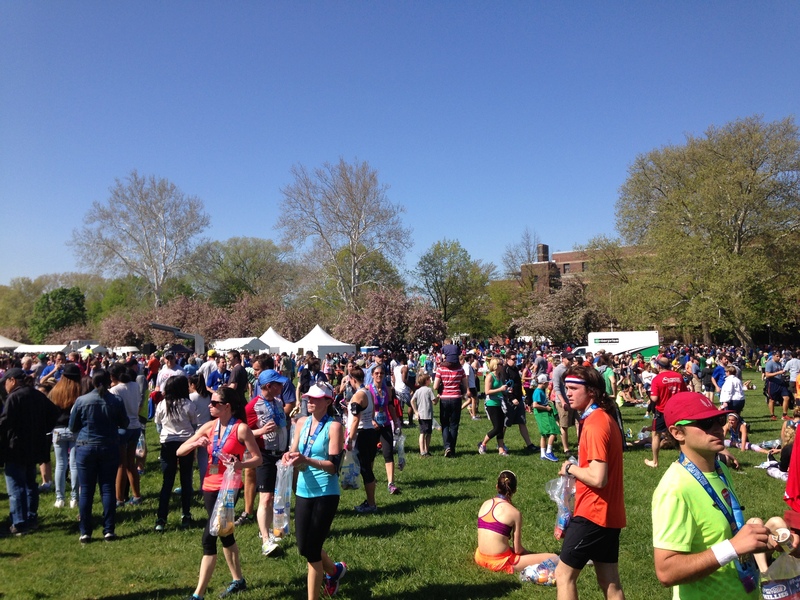 ^^ a little look into the post-race area down at the Philly Navy Yards. Mia and Lindsay had set up a cheer spot around the City Hall (big thank you!!) and so I went to meet them for a post-race bite to eat. This was the next step on our Philly eating adventure and while a typical brunch fare of eggs and pancakes usually sound good, we went for an Italian hoagie of sorts. Mia recommended the Paesano [Beef Brisket, Horseradish Mayo, Roasted Tomatoes, Pepperoncino, Sharp Provolone & Fried Egg] but of course I had to go rogue and order the Diavlo [Spicy Chicken with salami, roasted tomatoes, broccoli rabe, herb cheddar spread & sharp provolone]. Folks, the brisket and fried egg are a game changer and that is certainly the sandwich you should order if you get a chance. 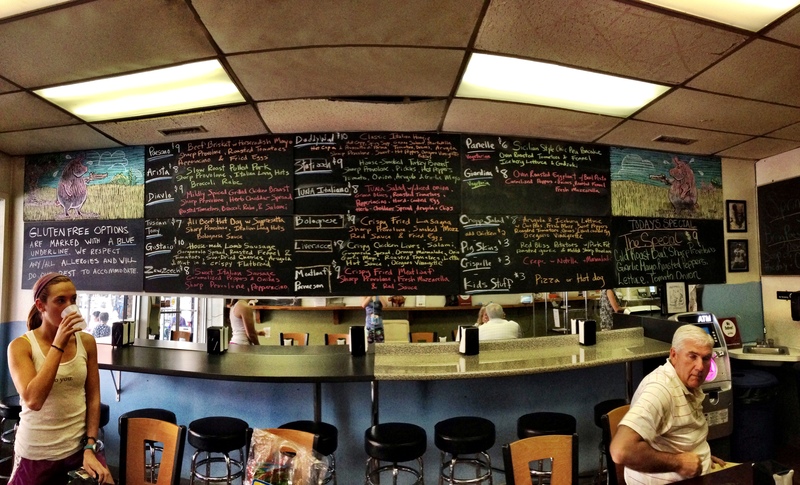 Because we arrived right around 11, we had no trouble ordering or snagging a table. But, an hour or so later and there would have been a line out the door! What’s hilarious about this place is that it seems like such a hole in the wall location and yet is such a well known establishment. So well known that if you see their hours below, they do their own thing. It’s lunch and early dinner or nothing. As we walked the three or so miles back to Mia’s apartment, we passed oodles of shops and plenty of open air markets. I swear, the produce that was being sold was SO DARN CHEAP!! All types of berries (good berries too!) for $1. I was just about to stock up when I realized that trekking back to the city with bags of goods did not seem like the smartest or most enjoyable plan. Ah well, another day. 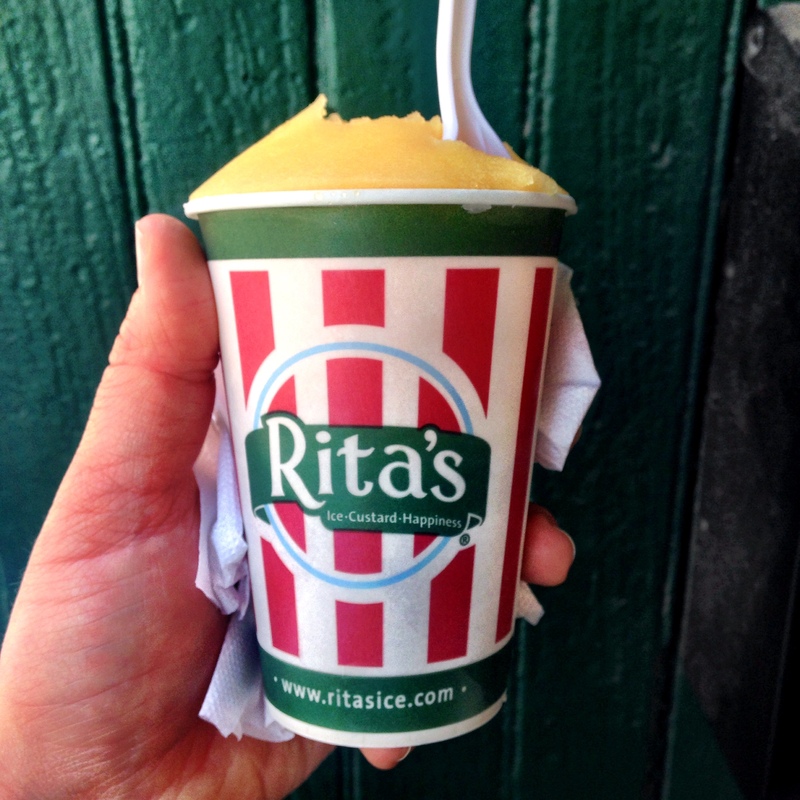 I did have to stop into a Rita’s Italian Ice for the first Italian ice of the season. For those who aren’t familiar with this whole concept of seasonality – it’s a thing. 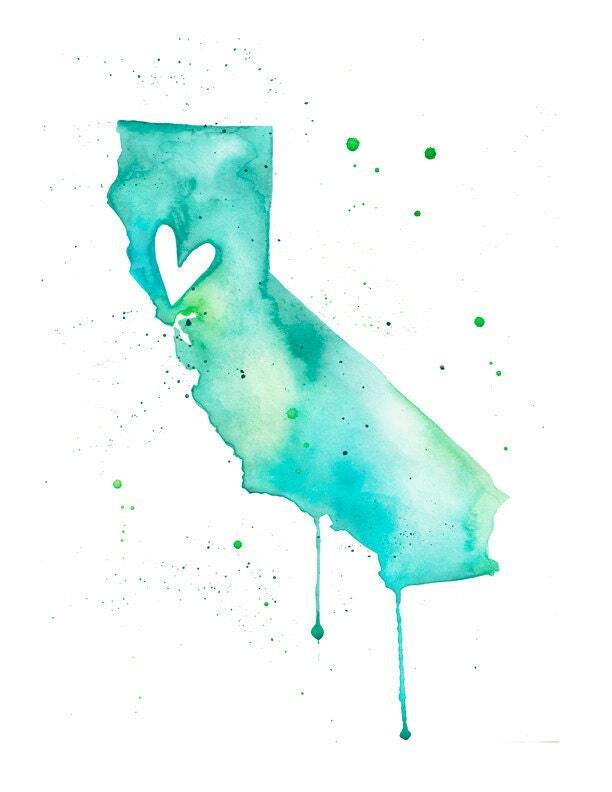 We Californians are totally fine with selling peaches and berries and ice cream year round. Out on the east coast, they like to close shop for the winter and only sell produce that’s in season. Well, lucky for us, we are entering into the best seasons!! So, with a shower, the remainder of my sandwich (or really Lindsay’s), an iced coffee and nice afternoon in the Penn campus park, it was a trip well done. Another city in the books and a wonderful spring weekend celebrated. 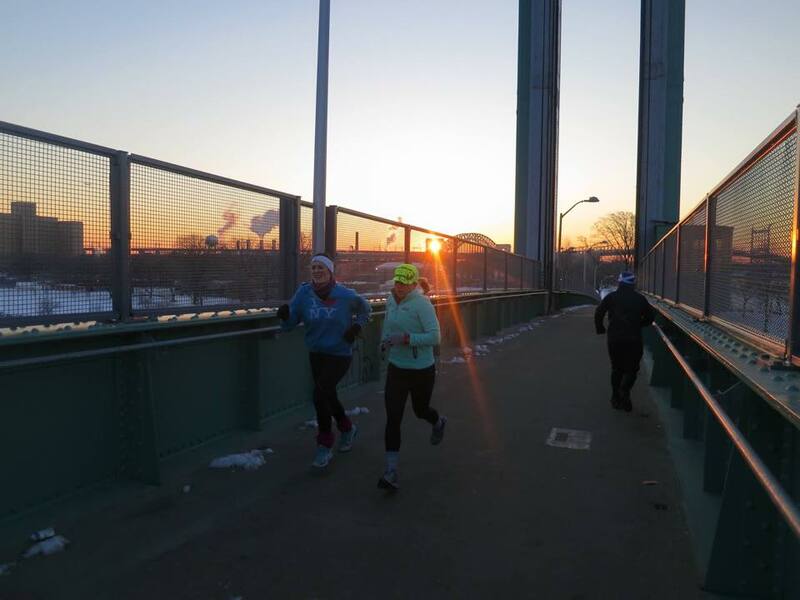 Have you been to Philly or run Broad Street? What are some of your favorite spots? 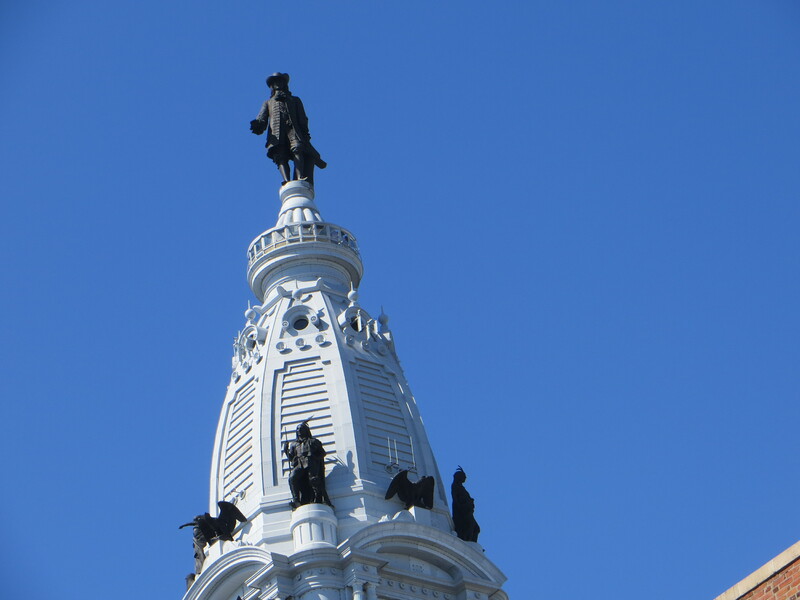 Philadelphia. 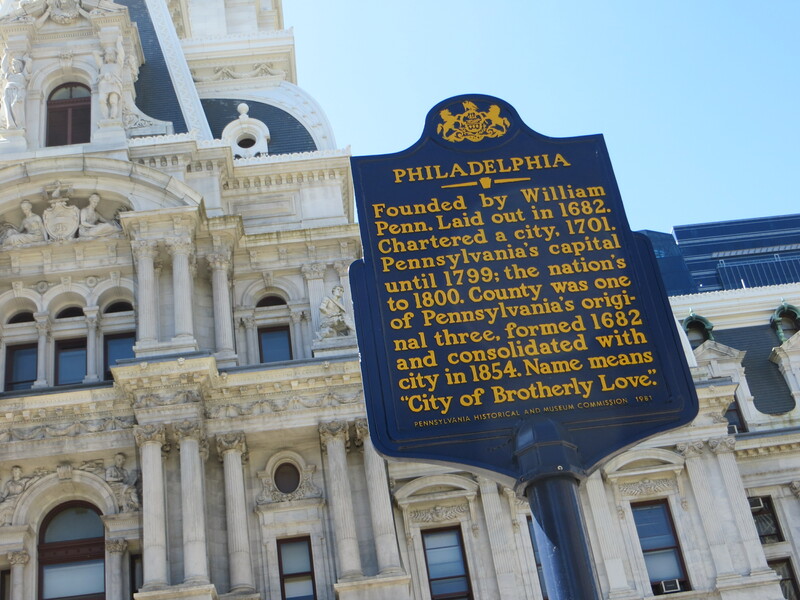 A city of history, pretzels, cheese-steaks, and brotherly love. 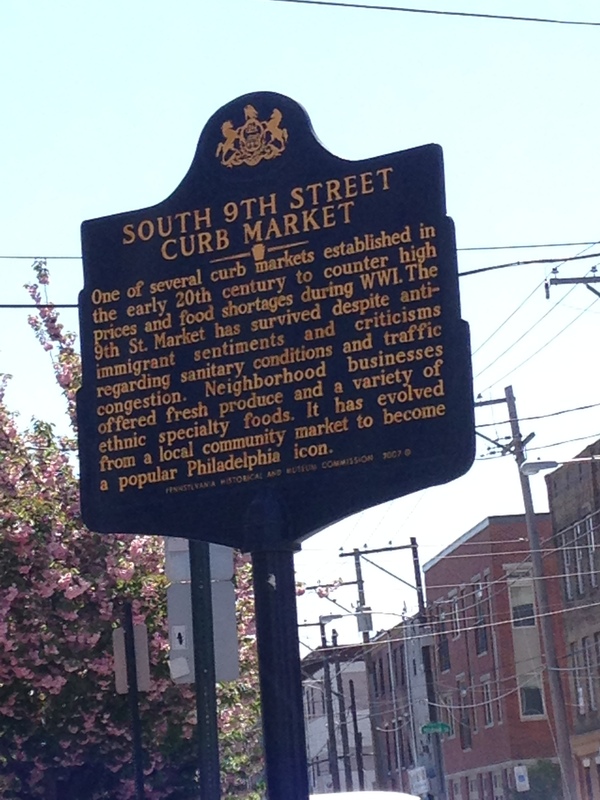 Food > the Liberty Bell (at least for this trip) 🙂 Since I was fortunate enough to visit Philly as a child (and made all the obligatory touristy/educational trips), I left this excursion up to running and wandering. This is Alex. She is amazing. She also happens to be a fashion designer for Ralph Lauren. No big deal. And yes, if I could race in Sperry’s I would. 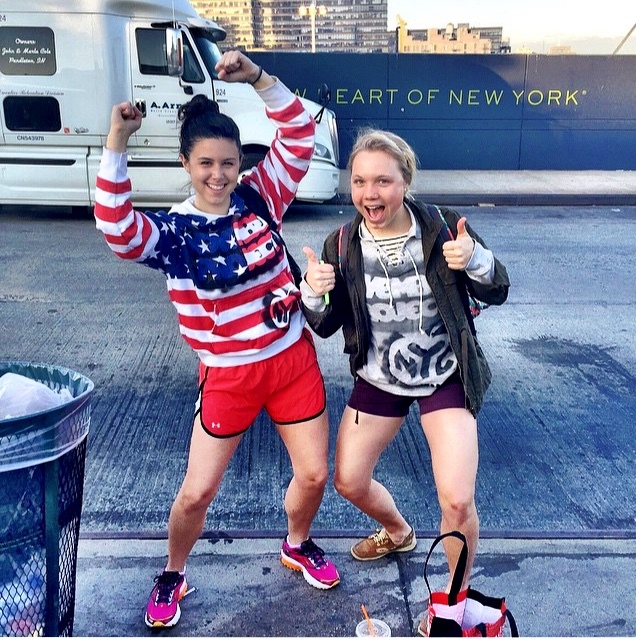 As I said, this trip was mainly made for the purpose of running the Broad Street 10-Miler, but when my roommate and friend Lindsay decided to join, we were able to do a bit more exploring and check off another city on the east coast bucket list. Started the morning with a nice juice and probably the only hope of vegetables I would get all weekend. I was able to snag it for a mere $5, which is a steal in comparison to what most juices go for. Oh New York City and your outrageous prices. Once we arrived in the city, Alex and I picked up our race bibs at the Philadelphia Convention Center, which I have to say was underwhelming. 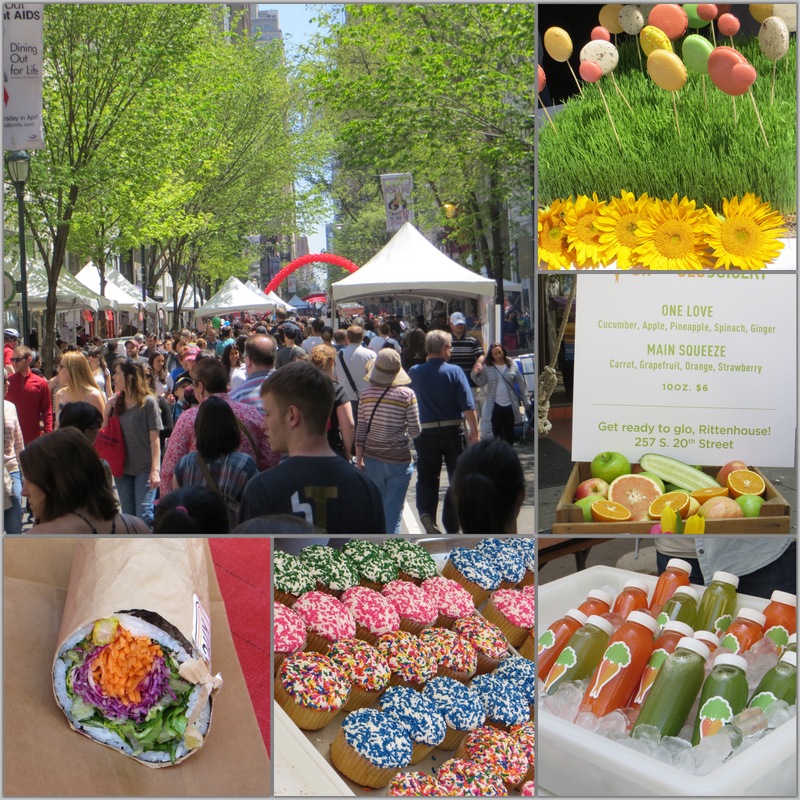 From there, it was a short walk to the Rittenhouse Square where we found ourselves amidst a weekend street festival (definitely made up for the lackluster bib pickup). Just look at all the people up there ^^ There was BBQ, free photo booths, and swag giveaways (if you are into the cheap sunglasses and drink koozies). 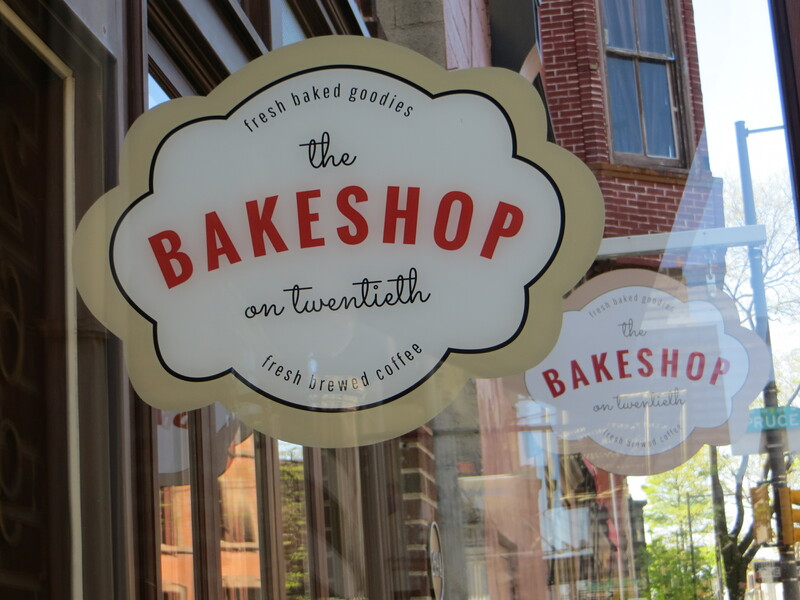 From sushi burritos to cupcakes, cannolis to green juice, one could have been in foodie heaven. 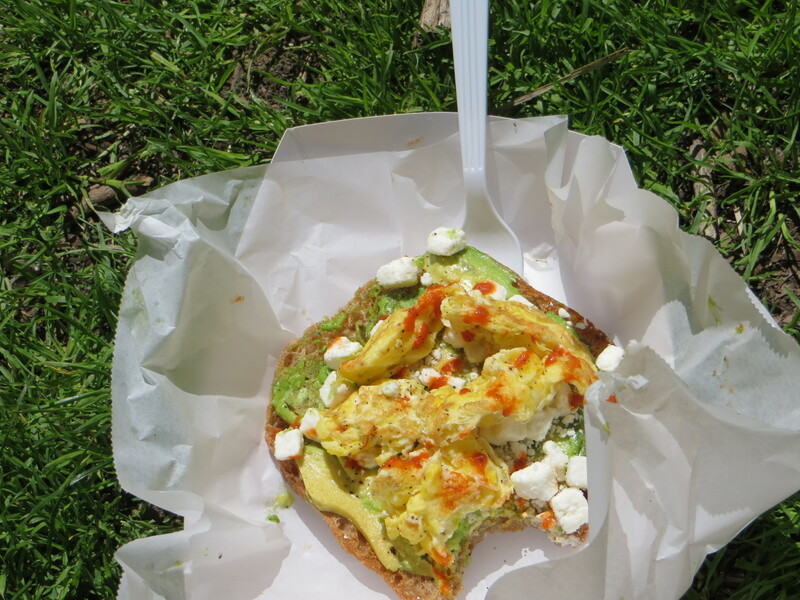 Of course I opted for more of the free sample route, but everything looked divine. 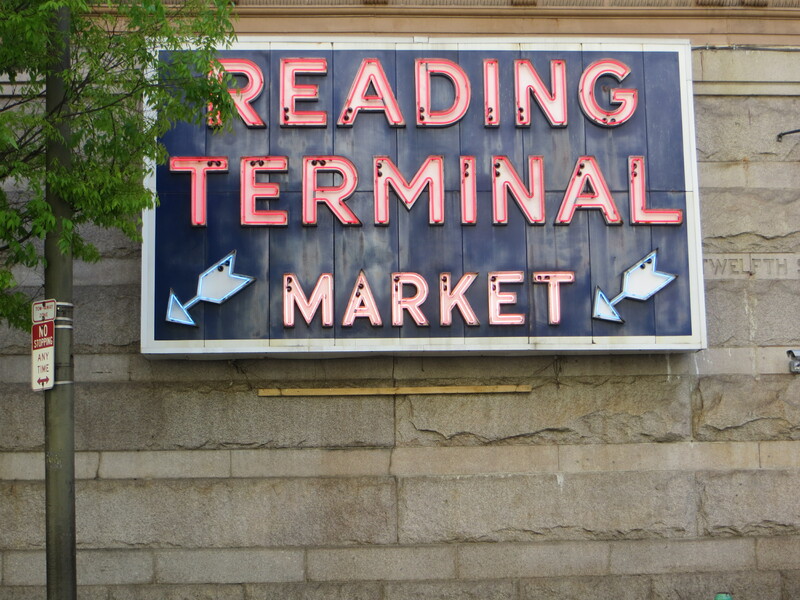 A trip to Philly is never complete without a trip to Reading Terminal Market. I am 99% sure I went here when I was in elementary school and refused to try the famous cheese-steak. Of course, that was during a time where I avoided all types of Mexican food and mint chip ice cream. For those who don’t know me, those two items are now very high on my top 10 favorite foods list. Anyways, Lindsay and I met up with my friend Mia (who by the way crushed her Boston marathon with a time of 3:25!!) 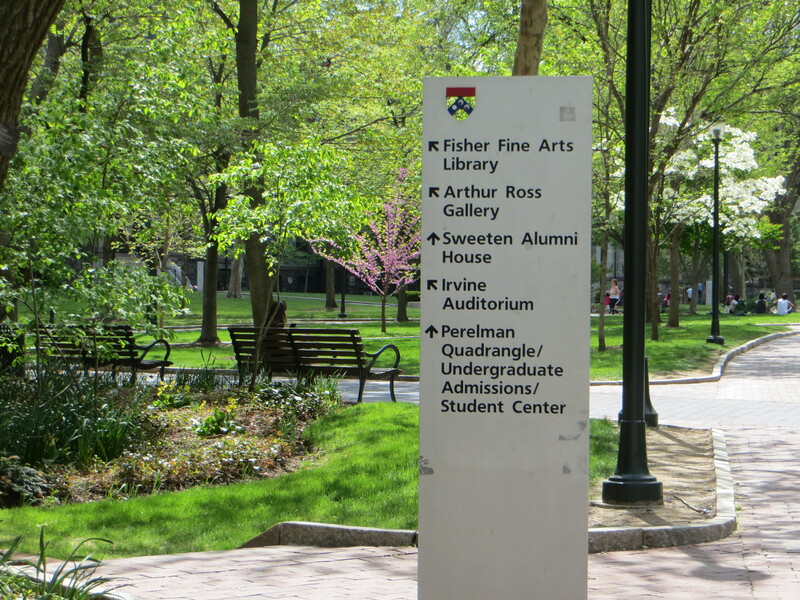 who is graduating from UPenn this year and knows all the good spots to visit in the market. She led us around and let us know which spots were touristy favorites and which spots were the real deal. Since we couldn’t taste-test every item, I’ll have to leave the final decision up to you all. Everyone knows there is a hot debate about who has the best cheese-steaks in Philly — Pat’s or Gino’s. I’m not quite sure and may never know unless I line up all the contenders and sample it all. But, seeing as that didn’t happen this weekend, let’s work with what I did discover. One is going to need a whole lot of juice (maybe more on the green juice side) to balance all the meat, carbs, and sugar in this market. Next up is Beiler’s Doughnuts. These are “the” thing to get and boy was it worth it. Even better if you can see them rolling and stuffing the doughnuts while you wait in line. What’s better than that is if you can get one hot off the press. Who knew there was so much wonderful street art and murals in the city? 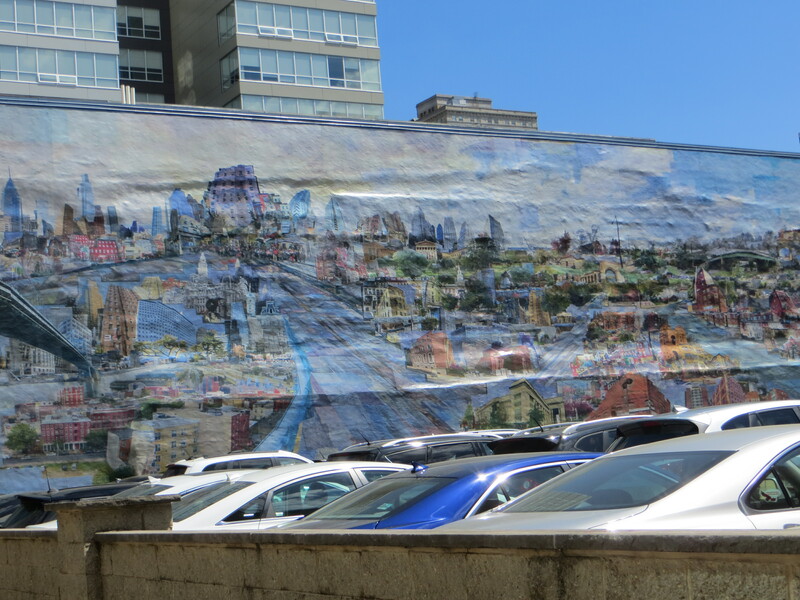 A look at Philly portrayed on a parking lot wall, as seen on our walk from the city to UPenn campus. Taking a nice stroll through the picturesque campus. 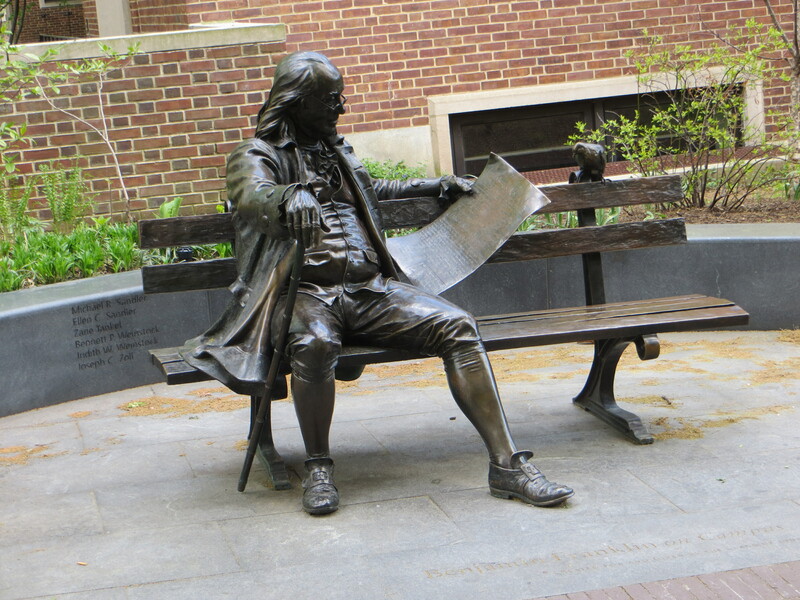 This is Ben and he resides right in the center of the square. Apparently the students (and maybe staff) tried to change the university name to Franklin University but obviously that plan failed. This is Ben again. Trust me when I tell you not to sit next to him and take a picture. He is located next to a frat house and I’ll just leave the rest to your imagination. Later in the afternoon Lindsay and I took another walk down to the river bank and strolled along the water. 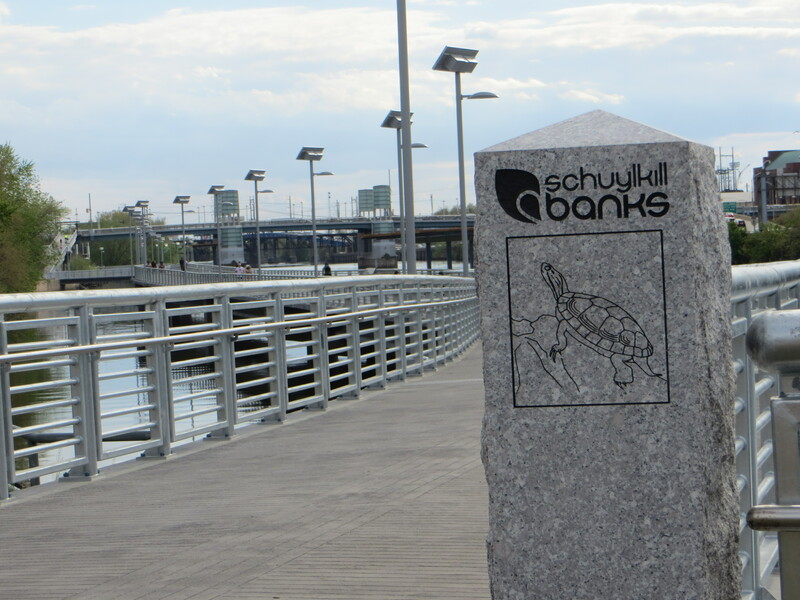 She had read about the “boardwalk” (pictured above) and while it wasn’t at all what we were expecting, it was nice to be out and about. It even made the instagram feed, so it was definitely worth enough.